"We both want to thank you very much for how beautifully you did our wedding rings. They are perfect for how we wanted them and the fit and the finish was perfect too." "I just wanted to let you know I’m over the moon with my ring. I just can’t believe how you knew exactly what I wanted without me describing it very well!! You’re a genius!! Thank you & can’t wait until I see the finished product!" 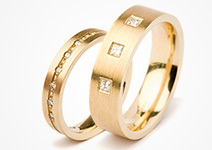 Wedding Bands are made to order in Platinum,Palladium, 18ct & 9ct White, Yellow & Rose Gold. Wedding Bands can be made in a variety of widths, sizes and weights set with Diamonds and made to fit around your Engagement Ring. View our Wedding Band range in the relaxed surroundings of our studio, discuss your exact requirements directly with our Wedding band designer. Absolutely no hard sell. Order your Wedding band from us, & we will Clean & Rhodium your Engagement Ring for FREE!